Appsterdam Greece, in cooperation with Orange Grove and Stone Soup, is bringing Mike Lee aka @bmf to Athens for one very special week. Mike Lee is a Silicon Valley-trained product engineer with a strong history of building great teams that build great products. Mike has worked at Apple, Nextive, Alaska Airlines, Delicious Monster, Tapulous and United Lemur. He has produced such hits as Delicious Library, Tap Tap Revenge, Obama '08, and Apple's Mobile Store. Mike lives in Appsterdam, the world capital of app development. His goal is to save Madagascar, his blog is at mur.mu.rs, and he has the world's largest collection of plush lemurs. Join the training sessions, talks and activities! 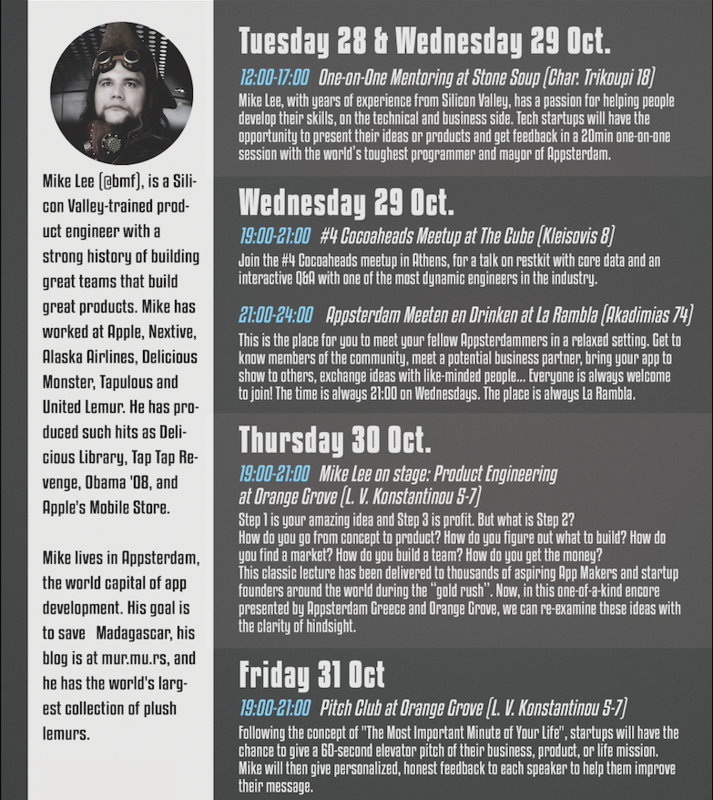 29 October: Interactive Q&A at the #4 Cocoaheads meetup at The Cube. 29 October: Networking at the Appsterdam Meeten en Drinken at La Rambla. 30 October: Mike Lee on stage about Product Engineering at Orange Grove. 31 October: Pitch Club - Come to pitch your business, product or life mission at Orange Grove. Appsterdam Greece is proud to announce the second of a line of talks by some international members of the worldwide Appsterdam community. As Appsterdammers travel around the world to work with each other, present on conference stages and hang out with their peers, we will pull them into Athens so you can meet them, pick their brains and show off all the great things Athens has to offer. Our latest guest, John C. Fox (@djembe), will be presenting his ideas about "The passions of the software developer" in the second International Speaker Stage. John C. Fox is an independent engineer that loves to travel, and experience different cultures and ways of living. He is known for the innovative MemoryMiner app, a platform for chronicling modern culture and society through the untold stories of our past and present. His talk will not focus on technical aspects of engineering, programming languages and toolkits, but on the passions that inspire developers and make them excel in their work. If you are looking for inspiration, and ways to make your everyday life and work more passionate and inventive. If you are a software developer whose objective is to share their passion with others through software. If you believe that our view of the world is intrinsically connected to our work and creativity. John's talk is for you. "The passions of the software developer"
Being a successful software engineer is way more than expertise in programming languages, SDKs and toolkits: facility with these things are mere “table stakes”. Your life passions and how you look at the world is what really matters, since it determines the types of inventive ideas you can come up with, how you'll attract attention to your work and how well you'll work with others. In this talk, I'll discuss how my life passions are front and center in the types of software I've developed. I'll make the case that what makes you a more interesting human being makes you a better developer. Jon C. Fox (@djembe) is an App-Maker, specialized in Digital Storytelling, time-based media annotation, and Digital Asset Management software that's built-to-last. Expert iOS, Mac and Web Application software engineer, whose most recent work is the Findery app for iPhone. Widely-travelled, foodie, musician, photographer, family man. Appsterdam Greece is happy to announce the International Speaker Stage, a line of events and lectures that will host international members of the worldwide Appsterdam community in Athens, Greece. We start with Saul Mora (@casademora). Saul came to visit Appsterdam in Amsterdam in 2011, when it all just started, and has been dropping by on regular basis ever since. This year he decided to check out the Greek Embassy, meet the people, enjoy the food and give a talk before he travels to Amsterdam to present at MDevCon. Wednesday 5th of March at 19.00 at The Cube Athens. Saul Mora will give a talk about "What’s the Next Big Thing for Mobile?" at The Cube Athens. Wednesday 5th of March at 21.00 at La Rambla (Akadimias 74). Saul will join the weekly Appsterdam Greece Meeten en Drinken in a cozy bar in the center of Athens. Hack night / Dinner in and around Stone Soup. Details will be announced soon, follow the Appsterdam or Stone Soup account (@stonesoupgr) to get updated. Saul is an independent iOS and Mac developer for MagicalPanda. He is the original author of MagicalRecord, a popular open source library helping to make sense of the Core Data framework. Saul produces the popular podcast for iOS, Mac and Cocoa developers, NSBrief. He also heads up the Denver Cocoaheads chapter and co-organizes iOSDevCamp Colorado, a semi-annual day of knowledge sharing and networking with Colorado’s iOS developer community. And, occasionally Saul has fun teaching young kids programming at a neighborhood elementary school. Saul has also been known to spontaneously give talks at a certain conference you might have heard of. We wish you all happy holidays, and for those who celebrate Christmas, we hope you are spending it with the people you love. For Appsterdam Greece, 2013 has been an amazing year. It was the year we kicked into gear and started rolling out more of the events we have in Amsterdam. The first of these are the Guru Sessions, informal hands on workshops for the community by the community. We will host the second one on January 11th where Yannis Gravezas will introduce you to the world of NUI in the Natural User Interfaces 101 Session, you do't want to miss it. We also introduced our first "made in Greece" session with the Appsterdam Open Source Software Launch Party, an event we hope to host more often during 2014. As we roll out more and more events in Greece we also want to expand our focus from Athens to more of Greece. As many of the core members from Athens travelled home to fix their parents computers, it seems like a great moment to bring everybody together. So coming Saturday we will have a small get together in Thessaloniki. We will meet at Cantina Tropicana, Egnatia 31 in Thessaloniki from 16:00 till the last one leaves. Feel free to share the Facebook event and invite all your friends. Hope to see you there and enjoy the rest of the holidays. - The Appsterdam Greece crew. Appsterdam Guru Sessions are informal, very hands-on workshops to share a technology or a technique between App Makers. Explanation from your peers, open discussion and practical experience are key to these sessions. Appsterdam Greece will host it's second Guru Session on Saturday January 11th of 2014. Natural User Interfaces is an umbrella term for a variety of technologies that enable users to interact with computers in human terms. Their use becomes all the more relevant as the internet of things materializes, and computers become invisible aids to our daily lives. NUI is for input what graphics is for output so among these technologies, the visual feedback ones are the most prominent and powerful. But what are the basic principles behind computer vision, and how can one actually develop apps with it? In this session Yannis Gravezas will introduce you to the basics of computer vision and NUI development using the MS Kinect. During the session you will be writing a visual application for hand tracking from scratch and in doing so, you will get to know all about the jargon and the mechanics of computer vision. And although we can not cover everything, you should go home with enough understanding and muscle memory to start messing around with this interesting, useful and current discipline of computer science. We open the doors at 10:00am and start at 11:00am sharp. There are limited seats available, so make sure you get your ticket. Lunch, snacks and drinks will be provided. To cover the costs we charge €6.00 per person, you can pay at the door. You should bring your laptop. We will provide information over the week about what you should have installed. But don't worry, there will be several people who can help you get set up during the event. Just make sure you arrive in time so they can help you. If you don't have laptop to bring, lets us know via Twitter or Facebook. Yannis is a NUI engineer and active contributor to the Open Kinect project. He is the author of LuaVision, a scripting NUI platform. Stone Soup will host the event at their space on Charilaou Trikoupi 18 in the center of Athens.